If you’ve received a wedding shower invitation and want to give the bride something she’ll have forever and maybe pass down to her own daughter, consider buying a formal place setting if she has registered for a pattern. Married couples will have many opportunities for formal dinner hosting over the years – from sit-down dinners with friends to big family gatherings during the holidays. 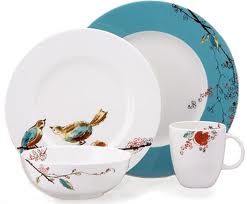 Picking a china pattern is the most straightforward part; some of our favorites are included below. But putting together a formal dinner table can be more daunting for newlywed hosts, so read on for some simple tips to set the perfect dinner table. Always use a good quality tablecloth, it should hang about 1 ½ feet over the table edge. Then place a runner over the tablecloth and add flower arrangements, candles or seasonal decorations to personalize your table. 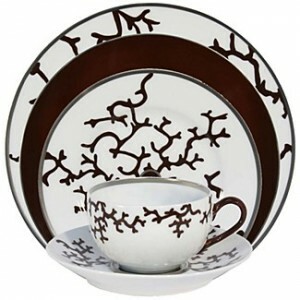 Dinner plates should be placed at the center of each place setting, salad or bread plates should be placed slightly above and to the left of the dinner plate. Silverware should be laid from the outside of the plate moving inwards. On the left, the salad fork is placed farthest from the plate, then the fish fork and then the dinner fork. On the immediate right will be the dinner knife (all knife blades on the table face inwards) then the soup spoon. The dessert fork and spoon are placed above the dinner plate in a horizontal position. The coffee cup is placed to the right of the dinner plate, just next to it. 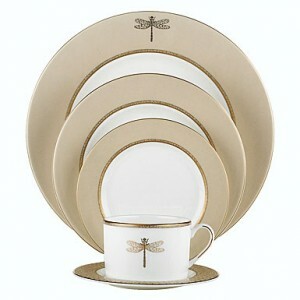 The glasses are kept on the right hand side of the dinner plate, above the coffee cup. Order the glasses as follows moving from left to right: water glass, red wine glass, white wine glass and then champagne glass. Fold cloth napkins into rectangles and place them either underneath the forks or on top of each dinner plate. Mastering these table setting basics should give any newlywed couple the confidence to host a fantastic dinner party. So give that couple a headstart by adding to their china settings. And if you’re hosting the bridal shower, shop the fantastic selection of wedding shower invitations at LookLoveSend.com. Our fresh designs are printed on high quality paper stock and 100% satisfaction is guaranteed. The age of digital photography has made the custom photo birth announcement the standard rather than the exception. It wasn’t so long ago, however, that birth announcements provided just the news of baby’s arrival and the basic facts of name, birth date, time and size stats. When Is a Photo Not Required in Birth Announcements? Preemie. If you’ve had your baby early and are spending time in the NICU, both your spirit and baby may not be up for a photo op just yet. There is nothing wrong with getting the word out without a photo–it can wait! Medical issues. Prematurity aside, your baby could have other medical issues that preclude getting the kind of picture you would want. If your baby is needing extra care, and there are outward signs of your baby’s struggles, that may not be something you want to share with a photograph until things are better for both of you. Technology hang-ups. Let’s face it, sometimes our computers and photo gadgets aren’t humming along and we just can’t make it happen. Don’t let problems with technology keep you from getting a great-looking birth announcement out to friends and family who will be excited to hear the news and get basic information quickly. They will be just as excited to get that announcement without a photo. Wedding tradition stands strong when it comes to bridesmaids. Of the 11 million bridesmaids in action each year, brides still like having this entourage to help her stand out. 64% of bridesmaids wear identical dresses! The average age of a junior bridesmaid is 9-14 years old. The Bridal/Wedding Shower. In addition to planning and organizing the event, the Maid of Honor needs to make sure everyone knows where the bride and groom are registered. The best way to do this is to include registry information right on the wedding shower invitations. Shopping. If possibly, she is likely to accompany the bride on her wedding gown adventures. She’ll need to be ready with constructive advice and extra enthusiasm. The Toast. Less a tradition and more a contemporary trend, Maids of Honor are welcome to toast the bride and groom. Some choose to do this at the rehearsal dinner instead of the wedding reception, but it’s up to both the bride and her MOH to decide. 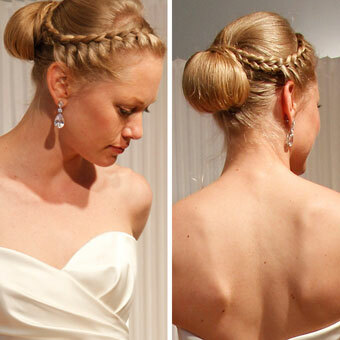 The updo–a classic look for wedding season, and an alternative to the recent trend in braids for brides. We’ve all seen the fashion magazines detailing the various celebrity updo sightings, from sleek bun to disheveled twist to romantic knot. But the wedding updo has a few more rules and recommendations, as shared by celebrity stylist Julien Farel in the March edition of Brides magazine. The recommended time for your updo practice session is two months before your wedding, just around the same time as you are arranging favors, ceremony details and mailing your wedding invitations. DO choose an updo that flatters the shape of your face. For example, making the crown taller can thin out a round face and stray hair tendrils will soften a square jaw. DO schedule a practice session with your hairstylist and take photos of your updo from every angle. Take this opportunity to ensure that you’ll love your wedding candids from every angle. DO make sure that any highlights are also applied to the underside that will be exposed by your updo. Bring your colorist a photo from your practice session so she will know exactly where to apply her color magic. DON’T buy an expensive hair clip, headband or other hair accessory until after you have had your practice session. Much better to experiment with a cheaper drugstore version in the event that it doesn’t match your chosen updo style. DON’T try a look for your wedding day that completely differs from your everyday look. Make sure you are comfortable with your chosen style – and that your groom will recognize you at the altar! Make sure you book your appointment well before the two-month mark, and talk with your stylist also about any color treatment such as highlights. Once you make that appointment, go ahead and start browsing for your wedding invitations, since you’ll need to have the addressed, stamped and ready to mail around the same time. LookLoveSend will ship your order the next business day and if you’re ordering more than 50 ground shipping is free! Using either toilet paper rolls or old newspapers, break guests (including the bride) into multiple design teams. Each team needs to choose a designated bride. The easiest way to organize this is for guests to count off as high as the number of teams your party needs to have. Match up all the ones, twos, threes, etc. and have them move to different areas in the room (or different rooms). From there, they work on their dress, either wrapping their bride in toilet paper or using newspaper, scissors and tape! Keep things moving and fun by not giving too much time for the teams to come up with their dress–10 minutes should be enough for some creative and hilarious outcomes. The real bride can play judge! Supplement the many useful kitchen gadgets and cookware a couple will receive with a robust recipe collection created by shower guests. 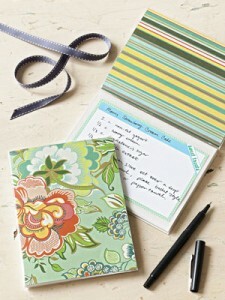 An easy way to do this is to include a recipe card in each wedding shower invitation. Guests either bring the card to the shower or send it back as an RSVP. Collect the cards and put into a recipe box, or bind into a booklet like the pretty one we found in Good Housekeeping (pictured at left). If you prefer email, simply print out submissions and place them in laminate sleeves into a three-ring binder that the bride can add to herself over the years. It’s easy to go with a favor that coordinates with a shower’s theme, but if you’re looking for a special favor that appeals to everyone, try decorative bulbs that guests can plant themselves. A few good choices with regard to cost and portability include hyacinths, tulips, and paper-whites. 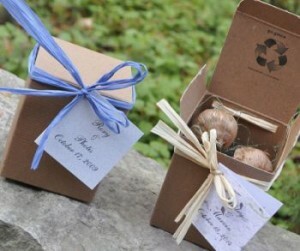 You can give the bride a distinctive bulb gift especially for her, perhaps using a flower she has chosen for the wedding. 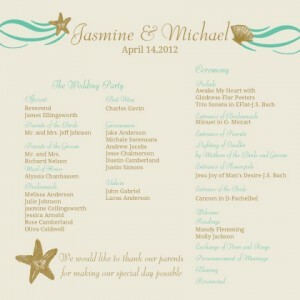 To find stylish wedding shower invitations to personalize for the event, shop www.looklovesend.com. There are plenty of styles to choose from, with many designs available in more than one color palette. Receive free ground shipping f you need to order more than 50 invitations. Even though the picture on the box has ladies wearing blouses with shoulder pads with bangs bigger than their foreheads, I can’t help but think that my fondue pot is still hip. After all, if my local wine bar is pairing wines with fondues, I should try it too. 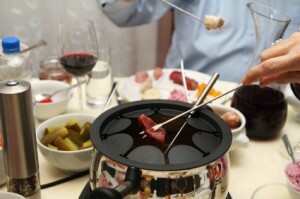 Decide on some fondue recipes that break away from traditional cheese and chocolate mold and serve fondue for your next party. Celebrating family birthdays in January, February or March? Why not combine them into one celebration with one party invitation and select a weekend that works for everyone. Make the weekend celebration an overnight or just a few hours, depending on proximity, logistics and schedules. 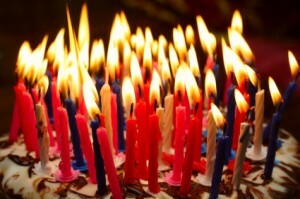 Trust us, if you’re birthday falls in any one of those months, it more fun to band together! If you have the chance to get to a major city, check out the professional scavenger hunts put on by Watson Adventures. Using the history and beauty of major landmarks, like NYC’s The Metropolitan Museum of Art, the Museum of Natural History, Grand Central Station, and others, their riddling clues engage “scavengers” from age 7 on up and make a wonderful activity for a mixed group of adults and kids. If the Big Apple or other cities where they operate are out of reach, try to create a hunt in your own neighborhood or local public area or landmark, like a park or community center if you need to be indoors. Check out the DIY hunts at www.scavenger-hunt-idea.com to find one that would work for your party. Find party invitations for your innovative wintertime party at www.looklovesend.com. You can personalize your invitations easily and your order will ship the next day. Putting your wedding program together isn’t usually the first thing you rush to do upon getting engaged. In fact, for some couples, knowing what to put in the wedding program is sometimes a mystery altogether. For others, it’s like an afterthought, only started after meeting with their officiant a few weeks or months prior to the wedding. Do not fear the wedding program. Most likely by the time you come around to the program, you’ve already ordered and mailed wedding invitations, or at the very least shopped for them. 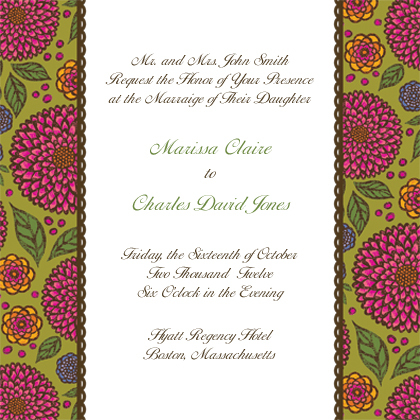 With a wedding invitation design in hand, it should be a cinch to put together a stylish program for your guests. The essence of the wedding program is simply as a guide to the order of events and to identify participants, music selections and readings. It can be as long or short as you want. The recent trend is simplicity, providing as many or few details as you feel are necessary all on one card (rather than multiple pages). After all, it’s not a play! You may not want to give it all away–there is something special about delighting guests with your choices for music, readings, etc. For a longer ceremony, detail selected readings and pieces of music, as seen in a more elaborate program at left. It includes the names of participants in the wedding as well as details about the music and readings. It maintains a simple style by printing all this information on a single card with easy-to-read font. Another memorable way to use the wedding program is to create one for the reception. Make programs available to guests as they enter the reception, or place them on the tables. Programs for the reception can set your guests’ expectations for the evening so they won’t miss out on anything. You can detail key events such as who’s giving toasts, the song for the couple’s first dance, when the cake cutting will occur (and what kind of cake), and any other special details you wish to provide. To find a wedding program style for your special day, shop the collection of programs at www.looklovesend.com. Their wide selection of wedding invitations and programs coordinate with all other pieces of wedding stationery for your day, including reception cards, place cards, menus and more. Everything prints on premium, high quality papers and ships the next business day. Wedding planning involves so many so-called rules; who pays for what, what happens when, and who does what. But when it comes to wedding invitations, there are several ‘rules’ that can be broken in the interest of time and cost savings. If you have a single guest who has been dating someone for a long time, it’s courteous to also invite that significant other, but there is no absolute rule that you have to automatically invite ‘and guest’. If budget is a concern, save your headcount for those who are closest and dearest to you and your fiancé. Couples are often creating wedding websites or social media pages dedicated to all things wedding. Using these sites to track guest responses is perfectly acceptable, but in these cases it’s advisable to still use response cards for the ease of guests who may not be tech-savvy. Order 150 wedding invitations but just 40 of the matching response cards – problem solved. Formerly a must-have, the inner envelope is no longer required except for the most formal of wedding celebrations. Let the great quality and stunning design of your invitation amaze your guests and they likely won’t even remember if you had an inner envelope or not. If you and your fiancé attended a friend’s wedding several years ago but have budget constraints for your own nuptials, don’t feel badly about not inviting that couple to your event. Good friends will understand the challenges of wedding planning and be just as happy to join you for a more intimate dinner party or get-together after your honeymoon. Chances are they’ll easily remember and relate to the wedding planning challenges you face. Traditional etiquette states that the people who are hosting (a.k.a. paying for) the wedding should be listed at the top of the wedding invitation. But with 64% of couples today covering most or all of their wedding costs, most of these couples still choose to honor their parents by listing them on the invitation. It is perfectly acceptable to give respect to anyone you choose on your wedding invitation. Your wedding invitation is your first chance to give your guests a sneak peak of your chosen wedding style. Browse the diverse selection of wedding stationery designs at LookLoveSend.com for stylish, high-quality designs that can be easily customized online. Your satisfaction is guaranteed and order quantities of 50 or more of any card will ship for free! Remember when turning 40 meant “Over the Hill” party invitations and black balloons? Thanks to older first-time parents, acceptance of a burgeoning “cougar” culture, and other more contemporary views on age (such as “60 is the new 40″ ), 40 really isn’t something to feel so somber about anymore. Unless, of course, you’re the one turning 40. Or 50. Or 30, or some other turn-of-the-decade that isn’t 21. How do you handle celebrating these milestones with a loved on or friend? Mow the number onto their front lawn. Not just for those in driving distance of Atlantic City, Biloxi or Vegas, you can likely stay local with casinos finding their way into every region of the country. Even on a tight budget, dollar slots and all-you-can-eat buffets make this a workable way to carouse with friends. A special dinner either at a restaurant or in a private home with a special group of friends and family is not just safe, it’s probably the most meaningful way for everyone to be involved and show their love for the guest of honor. Ticketed getaway near or far. If budget isn’t an issue, surprise a loved one with tickets to a destination on his or her bucket list. Go big: Montana, Hawaii, Rome, Bangkok. For a smaller budget, tickets to an off Broadway show/Nascar Race, a spa/golf weekend away from home could delight. You need to know whether the guest of honor is in a celebratory mood about reaching this milestone. Also think about whether their personality can handle the element of surprise (control issues might make you reconsider). Invite as many guests as their age and have each guest write a brief note on something meaningful, such as an enlarged photo of the guest of honor from childhood. 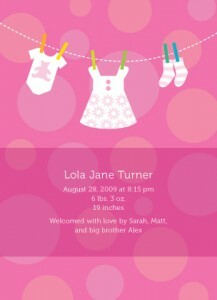 For a selection of personalized party invitations you can easily customize for the event, shop www.looklovesend.com. Ordering online is fast and easy, for quantities as low as 10. Invitations with coordinating envelopes are printed on premium quality paper stock and your order gets shipped the next business day. Even without a formal baby shower, expecting moms expect gifts during the weeks after baby arrives. Family and friends send gifts upon hearing the happy news, without waiting for the formality of a birth announcement. It may feel backwards, but if you’re getting your act together to order your baby’s birth announcement cards, take a tally of the gifts you’ve received thus far. Make sure those same gift givers are also on your birth announcement list. This may mean you have to order more announcements than you had anticipated, but you can put these extra cards on double duty as thank you notes. If the timing is right and you haven’t already mailed thank you notes for your gifts, set aside some birth announcement cards. Get your big batch of announcements addressed and stamped, then turn to a stack of announcements for gift givers, and jot a brief note of thanks for the gift right on the back. If you anticipate using some of your birth announcement cards as thank you notes, consider the style of card when ordering. Flat announcement cards work great as long as you leave the backside of the card blank–don’t add any pattern or additional photos. Folded cards looks less like a typical announcement, but have more space for writing. Or, divide your order into two styles, ordering some flat and some folded cards, but keeping the same design, photo and wording on the front. Gifts will likely continue to trickle in during the weeks and months after you mail announcements. Baby’s first birthday won’t be far behind, so be ready with a set of thank you note cards. Friends and family will instantly recognize who the card is from if you order baby thank you notes that coordinate with the design of your birth announcement cards. 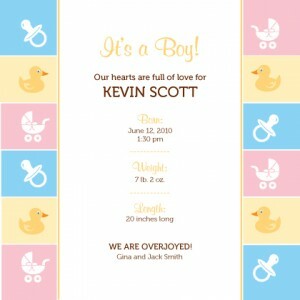 You can find a wide selection of baby birth announcement cards with coordinating thank you notes at www.looklovesend.com. Many designs are available in both flat and folded card styles, and come in your choice of glossy or matte papers. When you order 50 or more, shipping is free!